Compact South County venue offering a menu packed with seafood items curated by a skilled young chef. : The location of this casual-yet-intimate seafood venue is odd, surely. 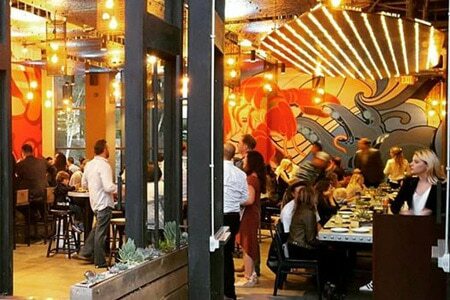 Set in a multi-story shopping center in Mission Viejo, the eatery's exit brings guests right into Union Market, a hipster-fueled food and retail space. Inside the restaurant, an industrial motif with blue and red accents sets an unapologetically relaxed tone. Yet young executive chef Michael Pham’s pedigree and talent cuts through the quirkiness to make this spot one of South OC’s most important restaurants. Pham earned his stripes under the tutelage of seafood impresario Michael Cimarusti (Providence), and this epicurean bloodline is evident throughout the compact menu. Small plates like braised abalone panna cotta show the kind of progressive acumen rarely seen in the neighborhood, while the crispy salmon skin “chips” with house guacamole demonstrate Pham’s playful side. Mains include the must-order egg noodles in uni cream and wild Pacific halibut with parsnip purée and wild foraged mushrooms. Those who prefer land-based fare will want to dig into the glazed rib-eye steak with haricot vert and rose pickled grapes. For dessert, order the seasonal cobbler to share. The list of libations is on the small side, but it does feature solid local craft brews that pair well with raw bar offerings.